Looking to get away for the holiday weekend? Look no further than the rugged northern Argentine province of Salta. The region, one of Argentina’s most beautiful, is a top destination for Semana Santa, or holy week. The province, as well as the city which shares the same name, is known for historical sights, folk music and outdoor activities such as trekking, rafting and horse back riding. 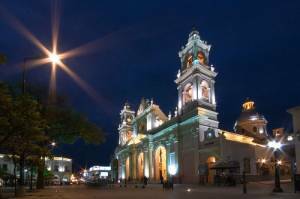 Salta is 18 hours from Buenos Aires, but traveling there is by bus is comfortable and relatively cheap. For flight information visit our Salta transportation page. In the city, check out the Cabildo, or City Hall, which has been turned into a museum, and is surrounded by popular cafes and bars. If you’re looking for some culture, check out the Museo de Bellas Artes, the Museo de Arte Contemporaneo, or the Museo Historico del Norte. If you’re looking for a church on Easter Sunday, head over to the Iglesia Catedral. This cathedral was built in the 19th century and harbors the ashes of General Martin Miguel de Guemes, a Salteno and local hero. For a more rural excursion, head out on a tour to Parque Nacional El Rey. This is where you can trek through the forest and see the local animal population in its habitat. For a more detailed description of Salta and what it offers, check out our new and absolutely divine online guidebook to Salta. I agree, Salta is a geat and interesting city but there’s so much more around Salta that is off the touristy beaten track e.g. Pumamarca, Iruya, Salinas Grandes and Cafayate. This page rendered in 0.498 seconds.